Today we’re going to have guest author Timm Bäder, maintainer of Corebird and a contributor of GTK+, talk about the changes in store for writing composite widgets in GTK+ 4.0. In GTK+3, only GtkContainer subclasses can have child widgets. This makes a lot of sense for “public” container children like we know them, e.g. GtkBox — i.e. the developer can add, remove and reorder child widgets arbitrarily and the container just does layout. However, there are more complicated widgets in GTK+3 which don’t inherit from GtkContainer, e.g. GtkSpinButton or GtkSwitch. These never have real GtkWidget children. Consider, for example, the two clickable areas in a GtkSpinButton. I’m not calling them “buttons” here for a reason, since in GTK+3, they are not actual GtkButton instances, as GtkSpinButton is not a GtkContainer. Instead, GtkSpinButton has to work around that fact, and create two GdkWindows for the up/down areas and then render two icons in there; care about hover and CSS states; various button up/down events; and the GdkWindow lifetime, etc. In order to work around the GtkContainer requirement, in GTK+3 we introduced gadgets (GtkCssGadget). On the styling side, a gadget corresponds to a CSS box and therefore represents one node in the CSS tree. On the widget side they were being used to have “widget-like”, CSS-stylable, children for non-container widgets. Of course there were plenty of changes needed to support these use cases in GTK+4. I’m not going to list all of them here (in particular the more ugly ones like focus handling), but I think most of them are quire interesting and important for application developers and custom widget authors. Generally, we’re trying to get a away from special cases and go a more general way by re-using widgets wherever we can. So, instead of using a PangoLayout to display text, widgets should use a GtkLabel. If you have a clickable area with button-like semantics, try to use a GtkButton. 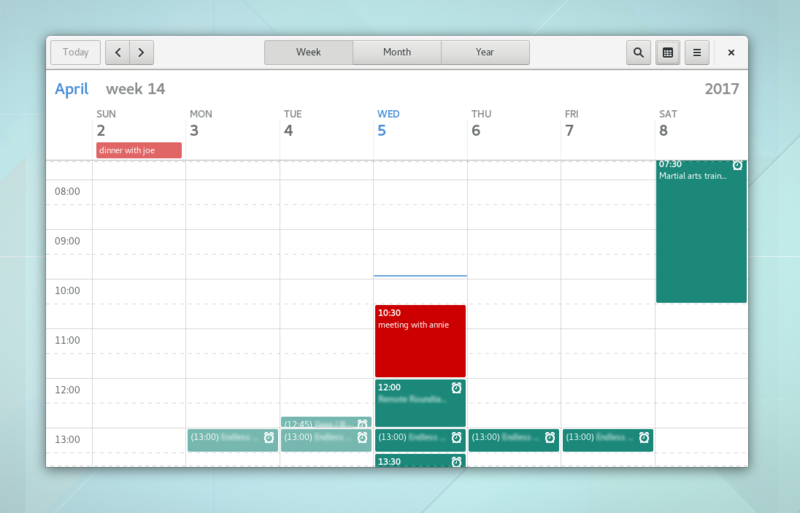 If you want to lay out widgets in horizontal or vertical orientation, use a GtkBox. This way we have one widget tree that both input and rendering can operate on. In practice, this means mostly getting rid of all the gadgets used inside widgets, as well as standalone GtkCssNode instances. Every widget in GTK+ (both 3 and 4) saves a pointer to its parent widget. This parent can be set using gtk_widget_set_parent(), and all the GtkContainer::add implementations eventually had to use this function to set the parent of the given child widget. to add new child widgets before or after a child widget that’s already in the parent’s list. These can also be used to reorder children child widgets by passing a child that already has the given parent set. Since lots of widgets inside GTK+ currently use composite widget templates in XML form, GtkWidget now also has its very own GtkBuildable::add_child() implementation to support this use case. This is what e.g. GtkFileChooserWidget uses which is almost exclusively defined in XML. Since we frequently need to use arbitrary CSS node names for arbitrary widgets, GtkWidget now has a construct-only property called GtkWidget:css-name that will be used as the css node name if specified. If not, the one passed to the widget’s gtk_widget_class_set_css_name() call will be used. If none of the 2 have been used, the CSS node will simply be called “widget”. There are already a few widgets in current master (and side-branches) that were converted from using a variety of GtkCssGadgets, GdkWindows and PangoLayouts to using actual widgets. The end-goal being, of course, to re-use widgets as much as possible, therefore reducing code size and maintenance burden. In GTK+3, GtkSwitch is a direct GtkWidget subclass (yay!) that uses a GdkWindow for the input (clicking on the switch will enable/disable it), one GtkCssGadget for the widget itself, two PangoLayouts for the ON/OFF text and another GtkCssGadget for the slider. In GTK+ master, the switch still has its widget-level GtkCssGadget so it supports min-width/min-height CSS properties and CSS margins, but the slider gadget has been replaced by a GtkButton and the two PangoLayouts are replaced with GtkLabels. This way we can save roughly 300 lines in gtkswitch.c. Theoretically we also have more features and can e.g. use the limited support for the text-decoration CSS property that GtkLabel supports, but I’m just going to doubt that this is very useful. As noted earlier, GtkSpinButton could easily use actual GtkButtons for the up/down areas, and it does so in GTK+ master (which will become GTK+4 at some point). This gets rid of another 300 lines in gtkspinbutton.c. Through using GtkButtons, the old icon helper gadgets also become actual GtkImage instances. Unfortunately we have to implement some of the GtkGesture magic ourselves here since GtkSpinButton also supports middle and right clicks on its buttons while GtkButton::clicked only reacts to single, primary mouse button clicks. GtkLevelBar manages a set of blocks and assigns different style classes to them. In GTK+3, these blocks are all GtkCssGadget instances. All of them are “dumb” in the sense that they don’t do anything special — they are just CSS boxes and that’s it. That’s why converting it to use GtkWidgets for all blocks didn’t gain much of a reduction in file size. GtkProgressBar uses gadgets for the trough and the progress nodes. It also uses a PangoLayout to display the percentage or a user-given string. In master, both trough and progress are widgets and the PangoLayout is a GtkLabel of course. Not having to listen to GtkWidget::style-changed (which gets done automatically for widgets) and not having to draw the PangoLayout ourselves (which the GtkLabel now takes care of) yields a nice code size saving of around 200 lines, however. GtkExpander is more complex than it looks like. In GTK+3, it consists of 2 GtkBoxGadgets (which is like a GtkBox, but not a widget…), one gadget for the arrow to the left of the title widget, the title widget and the actual content widget. In master, this is done using an actual GtkBox, and a GtkIcon (an internal widget) for the arrow. I’m not sure if this is the best way to express the GtkExpander functionality, e.g. we could also use a GtkButton for the arrow+title widget combination. Since GtkBoxGadget is already almost a perfect GtkBox clone, the code savings here aren’t very interesting, but not having to listen to GtkWidget::direction-changed once again saves around 30 lines. GTK+3 contains quit a lot of widgets that inherit from another widget for the sole purpose of looking and behaving like them. The problem here is that these widgets also inherit all the API of the parent class, which is only rarely wanted. The same applies to GtkButton. In GTK+3, GtkButton has lots of subclasses that inherited all the GtkButton API without actually supporting it. What happens if you remove the child widget from a GtkLinkButton? What if you set the GtkButton:label property of a GtkFontButton? Again, these are closed entities that have their own API to set and get various data and change behavior and/or looks based on them, but that doesn’t mean they support all the GtkButton/GtkContainer shenanigans. 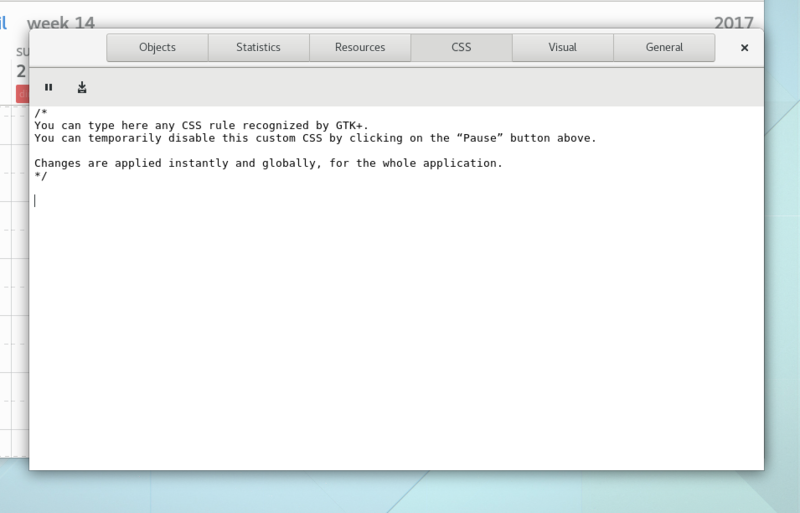 For this refactoring work we try to keep the CSS node structure as it was in GTK+3, i.e. we try not to break the CSS node tests we currently have in testsuite/css/nodes.c. A few of the more complex widgets inside GTK+ still heavily rely on gadgets and porting them away to use only actual widgets will be quite a lot of work. GtkRange is historically one of the most complex non-container widgets inside GTK+. It’s used both for scrollbars and scales so porting it to widgets might first need another round of refactoring. Another interesting case is GtkNotebook, which combines gadget and widget usage. Here we could e.g. use a real GtkStack to switch between pages and effortlessly support page switching transitions. Another exciting look into the future is of course Carlos’ wip/carlosg/event-delivery branch that gets rid of a ton of GdkWindow instances and makes widget input easier than ever before. 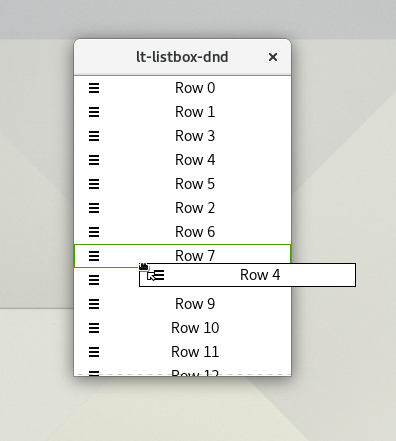 I’ve recently had an occasion to implement reordering of a GtkListBox via drag-and-drop (DND). It was not that complicated. Since I haven’t seen drag-and-drop used much with list boxes, here is a quick summary of what is needed to get the basics working. A little gotcha here is that the widget you set up as drag source must have a GdkWindow. A GtkButton or a GtkEventBox (as in this example) will work. GTK4 will offer a different API to create drag sources that avoids the need for a window. With this code in place, you can already drag your rows, but so far, there’s nowhere to drop them. Lets fix that. In contrast to drags, where we created a visible drag handle to give users a hint that drag-and-drop is supported, we want to just accept drops anywhere in the list. The easiest way to do that is to just make each row a drop target (i.e. a place that will potentially accept drops). The entries are the same that we discussed above. GTK_DEST_DEFAULT_ALL tells GTK+ to handle all aspects of the DND operation for us, so we can keep this example simple. Now we can start a drag on the handle, and we can drop it on some other row. But nothing happens after that. We need to do a little bit of extra work to make the reordering happen. Lets do that next. On the target side, drag-data-received is emitted on the drop target when GTK+ passes the data it received on to the application. In our case, we will pull the pointer out of the selection data, and reorder the row. The only trick here is that we need to take a reference on the widget before removing it from its parent container, to prevent it from getting finalized. And with this, we have reorderable rows. Yay! As a final step, lets make it look good. So far, during the drag, you just see just the cursor, which is not very helpful and not very pretty. The expected behavior is to drag a visual representation of the row. This looks more complicated than it is – we are creating a cairo surface of the right size, render the row widget to it (the signal is emitted on the handle, so we have to find the row as an ancestor). 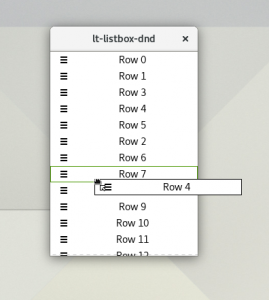 This article just shows the simplest possible setup for row reordering by drag-and-drop. Many refinements are possible, some easy and some not so easy. An obvious enhancement is to allow dragging between different lists in the same application. This is just a matter of being careful about the handling of the list widgets in the drag_data_received() call, and the code I have shown here should already work for this. Another refinement would be to drop the row before or after the target row, depending on which edge is closer. Together with this, you probably want to modify the drop target highlighing to indicate the edge where the drop will happen. This could be done in different ways, but all of them will require listening to drag-motion events and juggling event coordinates, which is not something I wanted to get into here. Finally, scrolling the list during the drag. This is important for long lists, if you want to drag a row from the top to bottom – if the list doesn’t scroll, you have to do this in page increments, which is just too cumbersome. Implementing this may be easiest by moving the drag target to be the list widget itself, instead of the individual rows. Many GTK+ users and developers have already heard of the GTK+ Inspector, a tool to inspect, modify and understand GTK+ applications. The Inspector is extremely powerful, and allows theme designers to test CSS changes on-the-fly and magnify widgets to see even the smallest details, lets developers check the application widgets and their properties, and lets users to play (and eventually break) applications. 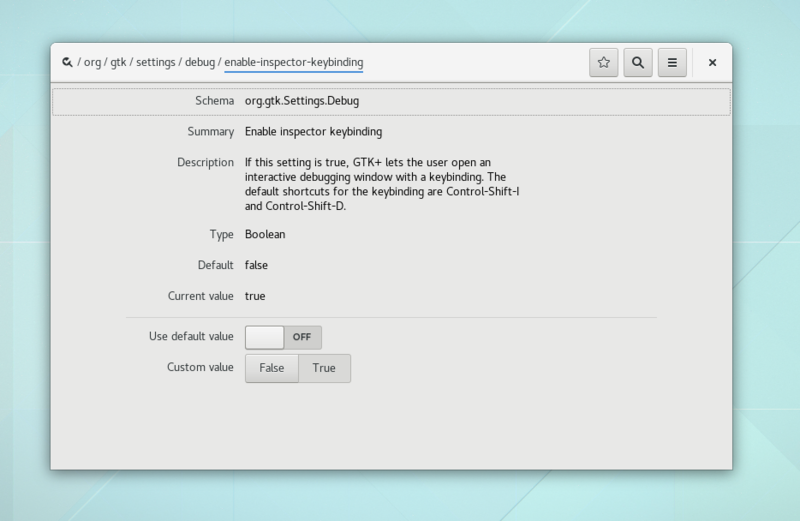 In this article, we’ll explore the GTK+ Inspector and show what can you do with it. Done! The Inspector is now enabled! There are multiple ways to bring up the Inspector. You can open it while using the application, by typing <Ctrl> + <Shift> + D (or <Ctrl> + <Shift> + I to automatically select the widget under the mouse pointer). Alternatively, you can launch the application from the terminal with the environment variable GTK_DEBUG=interactive. And that’s all you have to do. Now let’s explore the various functions that the Inspector has to offer. Objects: exposes the widgets of the application, and allows editing properties and seeing detailed information about each widget. Explained below. Statistics: shows miscellaneous statistics of the application. You need to run the application with GOBJECT_DEBUG=instance-count. Resources: shows the various resources that are embedded in the application binary, such as custom icons or GtkBuilder files, among others. CSS: allows testing CSS live. Explained below. Visual: controls some visual aspects of the application, such as the text direction, dark/light variant, the theme, the scaling factor, etc. General: shows miscellaneous information about the GTK+ application (and the session it is running in). Those 4 annotated sections of the Inspector are the most commonly used ones. Theme designers will want to check (3) and (4), while developers usually use (1) and (2). You can now easily change the properties of that widget by browsing the Objects > Properties tab. You can change, for example, the visibility of a widget, the text of a label, and much more! Now that you know how to inspect a GTK+ application, play around and explore how many applications are organized. Change the widgets’ properties and see what happens. Most of the times, this is safe and won’t break your GNOME session, or freeze your computer! Whoa! The window became alien! That CSS code changes the background color of any GtkStack widget inside a GtkWindow. If you want to learn more about CSS selectors and how GTK+ is using CSS for theming, there are some useful links at the end of this article. The cautious reader may ask: what is the hierarchy of CSS elements? How can I see which CSS elements are available? Fear not! 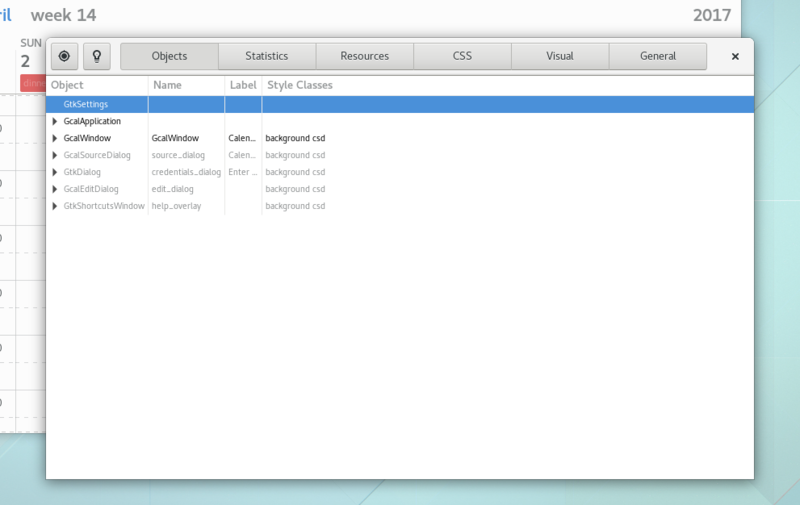 GTK+ Inspector allows you to easily check the CSS hierarchy at the Objects > CSS Nodes tab. 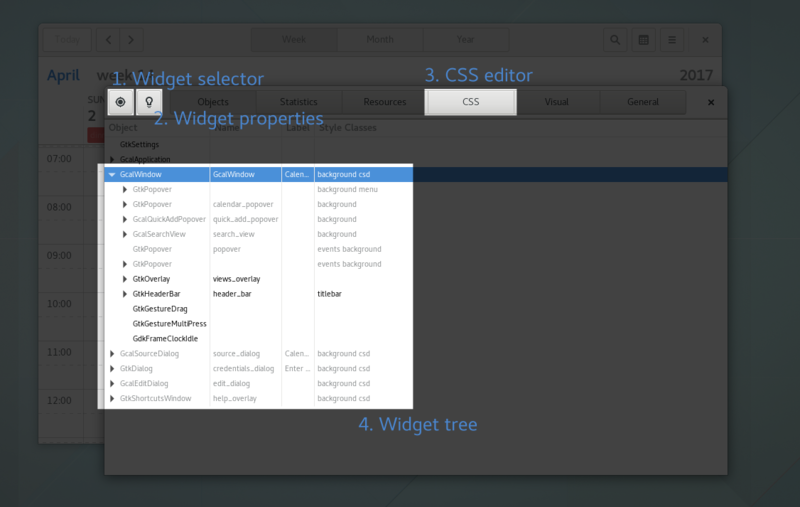 GTK+ widgets have documented CSS names. You can browse the GTK+ documentation to see how widgets are organized, and how you can use CSS to control the various aspects of the widgets. Looking good? Join #gnome-design and share your awsome CSS snipplets with the community! While this article explores some of the biggest aspects of the GTK+ Inspector, this is by far not an exhaustive list of all the features of the Inspector. After reading this article, however, you’ll hopefully be able to open the Inspector and explore more of its awesome power on your own. Doubts? Comments? Suggestions? Stop by and leave a comment, join #gtk+ channel at the GNOME IRC network and let us know what you think!